Cotton plaster is applied with a trowel on the wall. The surface must be clean and rough. With a little practice anyone can distribute the Bamwolle evenly on the wall. 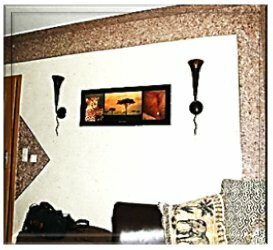 In contrast to the wallpapering make crooked walls and edges is not a problem. For more information, please visit the page Processed cotton plaster. Cotton plaster has a chunky texture and can store significantly more moisture than other wall coatings and thereby acts moisture-regulating. 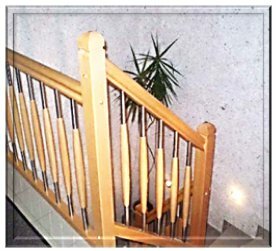 You will experience, daß sich eine mit Baumwollputz tapezierte Wand deutlich wärmer anfühlt. Baumwolle ist ein hervorragender Wärmeschutz, even at low film thickness. Those who wanted the difference already, if you leave the house with or without T-Shirt, contest. Cotton plaster hardly changed its appearance, similar to a good carpet. We get a lot of requests from people, which have been 15, 20 and even more years have not renovated your wallpapered with cotton plaster rooms, and therefore are completely thrilled. Of course, the well-known contaminants occur, for example in the field of light switches, or damage caused by mechanical influences just like conventional wallpaper. These can be repaired with a little skill virtually invisible again. 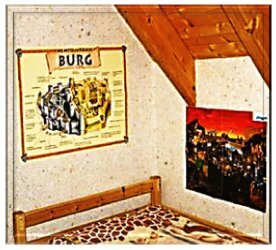 With cotton plaster You can zaubern.Streifen any kind of pattern on your walls, Rectangles, Waves, and even images are possible. With appropriate template, you can create unique works of art. Baumwollputz besteht aus einer Mischung von Baumwolle mit Zusätzen und wasserlöslichem Bindematerial. Feuchten Sie den Baumwollputz mit einer handelsüblichen Wasserspritze ausreichend an. Nachdem das Material ausreichend durchweicht ist, you can remove it from the wall. Sinnvoller ist es jedoch, to spray a new layer. Dann sehen die Wände wieder wie neu aus und Eigenschaften wie Wärmedämmung und Feuchtigkeitsregulierung werden mit jeder neuen Schicht sogar noch verbessert. You have already applied color on a flat surface? Dann erfüllen Sie alle Voraussetzungen für den ersten Schritt, das Weißen der Wände. Zum Auftragen der Baumwolle liefern wir Ihnen eine ausführliche Anleitung. Sie markieren sich 1m² irgendwo auf der Wand. Wir legen Ihnen immer einen Beutel mit genau der Menge für diesen einen m² in Ihre erste Lieferung. Nachdem Sie das Material lt. Anweisung mit Wasser vermischt und etwas gewartet haben, wear the plaster on the marked area on. Nach wenigen Versuchen haben Sie das Gefühl für das Material und die Technik entwickelt und können die restliche Fläche beschichten. It is always easier, than to paper the Wänd with normal wallpaper. Bei Flüssigtapete weichen Sie dann eine kleine Menge ein und bessern die Stellen nachträglich aus. That makes even fun. Honestly, We always like to show other people but things, welche wir selbst erschaffen haben. If the others do then also admires honest, fühlen wir uns super. In unseren Kundenmeinungen können Sie dies gut herauslesen. 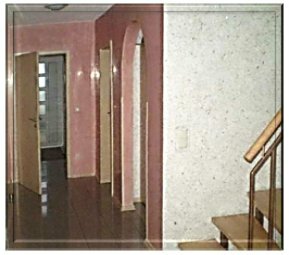 In cotton plaster added, daß jeder Besucher Sie von selbst auf Ihre neue Tapete ansprechen wird. A great feeling! Also, es war richtig spannend! Vom Auftragen (wie wird es wohl aussehen? ), übers Abtrocknen (na, hoffentlich wird’s was?!) bis zum fertigen Wandbelag (and, das kann sich sehen lassen!). das können Sie machen. Due to this,, dass der Baumwollputz die Farbe zum Teil aufsaugt, benötigen Sie jedoch mehr Farbe pro qm als üblich.